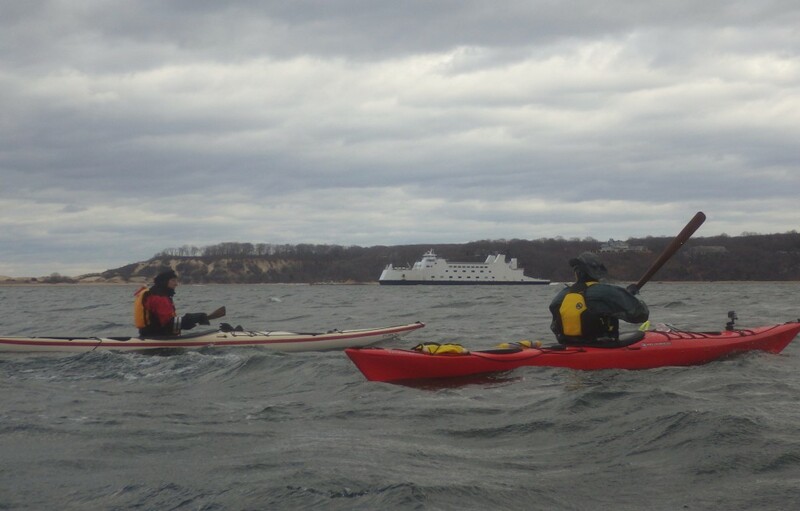 Alan just sent in a quick report and pix from last week’s paddle in Port Jefferson. The last Sunday of Winter found three NACK paddlers having to change their original plans of paddling out on the Sound to Rocky Point. 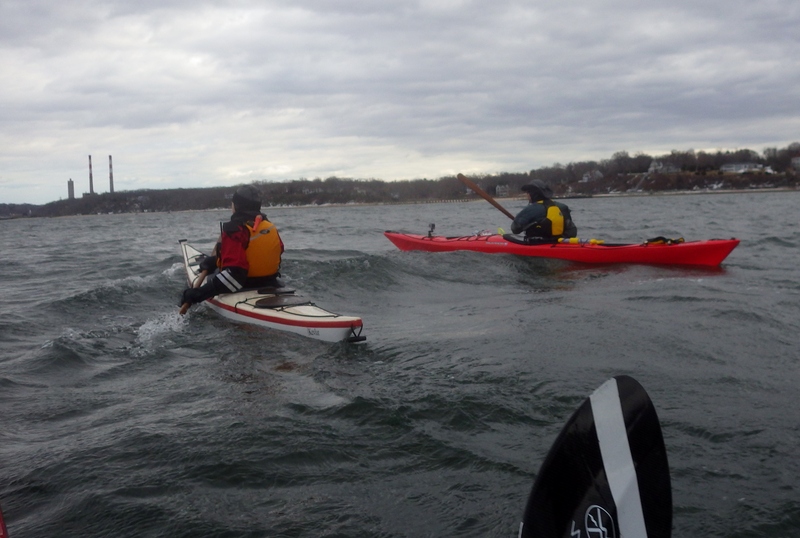 Small craft advisories for the Sound , (30+mph winds with 3’-5’ waves of barely thawed 35°F water) made the decision to change course & stay inside Port Jefferson Harbor/Conscience Bay an easy one. 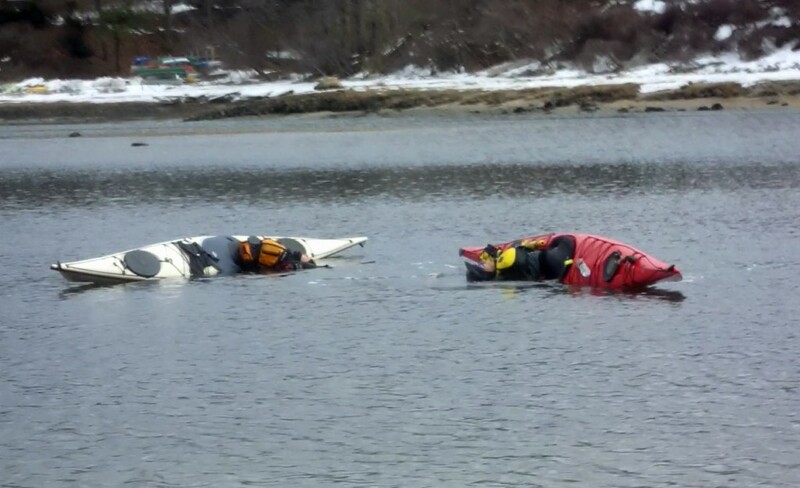 The news of a South shore tugboat captain drowning on the previous day after succumbing to the frigid waters off Fire Island was a sobering reminder of the dangers of paddling this time of year when air & water temps are both in the low-mid 30’s. The weather forecast for partly/mostly sunny skies was as far off the mark as Staten Island Chuck’s forecast for an early Spring! With overcast skies and a strong headwind we launched from Centennial Park on the East side of Port Jefferson Harbor and crossed over, hoping the Western shore would provide us some relief from the W-NW winds but we found nothing there but a long, hard slog every stroke of the way until we stopped outside Conscience Bay for a snack/hydration break. I kept my head bone dry throughout the trip but Debbie & Chris chose to test their neck seals & neoprene hoodies with some balance bracing (& even one synchronized balance brace!) in the calm, dead low tide waters in the channel leading into Conscience. We then got under way again, with the wind now at our back and small, wind-driven waves to surf on; it definitely made the return leg a much more enjoyable paddle. And the Sun did eventually come out. – It just waited until the last one of us had landed back on the beach & pulled our boat out of the water! Then came the clear blue skies. Only covered 7 miles but sure felt like WAY more. So that’s what you do when I’m skiing!